Since Mas Selamat escape on 27th Feb, this is MM Lee's first response to the issue. BAHRAIN: Minister Mentor Lee Kuan Yew does not believe Mas Selamat Kastari poses a threat if he remains at large in Singapore. This is because it is not a planned escape and he does not have the resources to harm Singapore if he remains in the country. But if he has escaped across the border, Mr Lee warned that Singaporeans would have to watch out for a return hit by Mas Selamat. The minister mentor, who wrapped up his three-nation visit to the Middle East on Friday, was speaking to the Singapore media in Bahrain. Mr Lee said Mas Selamat is a wily person who could persuade his custodians and Singapore has learnt an important lesson on complacency from the episode. "I give him full marks for winning the confidence of his custodians – that he's completely docile, completely passive and he's going to remain in captivity. It is... stupid to believe we are infallible. We are not infallible. One mistake and we get a big explosive in your midst. So let's not take this lightly. I think it's a very severe lesson of complacency," said Mr Lee. 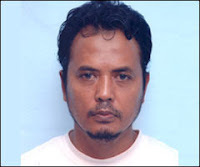 Since Mas Selamat's escape, police have received 950 calls and email messages about the case. Anyone with information on the fugitive should call the police at 999 or email them at spf_police_information@spf.gov.sg. Currently a Trainer, President of the WPYW and a Liverpool supporter! All views and opinions expressed are mine and do not necessarily reflect the views of any of my affiliations. Visitors are welcome to leave comments, however comments containing vulgarities, obscenities and racist remarks will be deleted. Published by Lee Li Lian (216-G Syed Alwi Road #02-03 Singapore 207799). Picture Window theme. Powered by Blogger.